Former Iraqi leader Saddam Hussein refused to enter a plea on the opening day of his trial on charges of genocide and crimes against humanity. 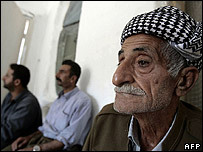 He is one of seven defendants being tried in Baghdad in connection with an anti-Kurdish offensive in 1987-88. The trial heard that 182,000 people were killed in Operation Anfal. Saddam Hussein and seven different defendants have already been tried for the killing of 148 Shias in Dujail in 1982. A verdict is due on 16 October. All the defendants in this latest case were present for the opening day of the trial, which is taking place in the same courtroom as the Dujail trial, in Baghdad's Green Zone. In the absence of a plea, Judge Abdullah al-Amiri - a Shia Muslim who was a judge for 25 years during Saddam Hussein's regime - entered a not guilty plea on behalf of the former Iraqi leader. Saddam Hussein's cousin Ali Hassan al-Majid - who gained his nickname "Chemical Ali" because of the anti-Kurdish operation - also refused to plead, and was recorded as pleading not guilty. The other defendants are former Defence Minister Sultan Hashim Ahmed, former intelligence chief Saber Abdul Aziz, former Republican Guard commander Hussein Rashid al-Tikriti, a former Nineveh governor Taher Muhammad al-Ani and former military commander Farhan al-Jibouri. All the defendants face charges of war crimes and crimes against humanity, while Saddam Hussein and Ali Hassan al-Majid are additionally charged with genocide. All seven face the death penalty if convicted. 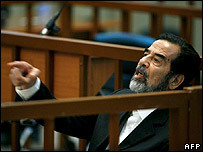 Saddam Hussein challenged the legitimacy of the court, as he had done at his previous trial. He refused initially to give his name, answering Judge Amiri's request to identify himself with: "You know my name." "This is the law of the occupation," Saddam Hussein complained, before identifying himself as "president of the republic and commander in chief of the armed forces". When asked to enter a plea, he replied: "That would require volumes of books." The prosecution opened its case by saying "weapons of mass destruction and air strikes" were used during the seven-month-long Operation Anfal, or "Spoils of War". "It is difficult to fathom the barbarity of such acts," said lead prosecutor Munqith al-Faroon. He said villages were razed to the ground, as the Iraqi army went into the region carrying out poison gas attacks and deporting elderly, women and children to detention camps where they "suffered harshly". 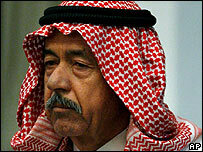 His claim that women were raped by guards and officials in detention drew a furious response from Saddam Hussein. "I can never accept the claim that an Iraqi woman was raped while Saddam is president," he declared. "How could I walk with my head up?" The defence is expected to portray the campaign as a legitimate counter-insurgency against Kurdish militias who were accused of helping Iran in the Iran-Iraq war. Chief defence lawyer Khalil al-Dulaimi argued that the trial was illegal because it was "established by an occupation entity", but his petition was dismissed by the five-member panel of judges. This new trial does not deal with the Halabja attack in 1988, where 5,000 Kurds are thought to have been gassed to death. A separate tribunal is dealing with that case. Human rights activists have questioned the fairness of the Iraqi judicial system and said there were "serious shortcomings" in the Dujail case. Three defence lawyers were assassinated and the original chief judge replaced. Prosecutors want the death penalty for Saddam Hussein and two of the seven other defendants in the Dujail case. All denied the charges. If Saddam Hussein is convicted and given the death penalty he may still appeal, raising the possibility that any execution could be delayed by years.